Featuring the unique Parallexx™ Horizontal Airflow Drying System, which draws in cool air, heats it to the desired temperature and then feeds it throughout the trays simultaneously. 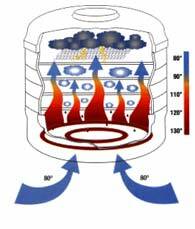 The food dehydrates as the Excalibur’s hot air evenly removes the moisture from the food, and the front of the dehydrator is open, allowing the unwanted moisture to escape. The horizontal airflow feature in the Excalibur ensures even dehydration and eliminates the need to re-stack trays during the drying process. The Excalibur is truly flexible, allowing trays to be removed to allow for drying larger pieces of food, such as complete fruits. The Excalibur dehydrator features flexible mesh inserts, which prevents food from sticking to the trays, making the seamless, polycarbonate trays easy to clean. The Excalibur’s adjustable thermostat offers the capability of perfect dehydration on every occasion and unlike many comparable dehydrators, which feature round edged trays, the dishwasher-safe trays of the Excalibur, feature square-edged trays, thus increasing the dehydrators drying capability. This food dehydrator is supplied with four trays, offering up to 4 square feet of dehydration drying area. The dehydrator is powered by a 2200W motor and uses a 4-inch fan. Cool air is drawn in the back, heated, and distributed evenly across each tray. During the dehydration process, warm air removes moisture from foods and is pushed out the front of the machine. Economical round dehydrators cannot distribute heat as evenly as the Excalibur resulting less controlled drying, and increase in time to dry and more maintenance due to frequent tray re-stacking and cleaning due to spillage. Victoras Kulvinskas is a Co-Founder of the Hippocrates Health Institute with Ann Wigmore, and author of several books including "Survival into the 21st Century". He is recognized as being the "Father" of the Raw food Movement. "I have been using and marketing Excalibur Dehydrators for over ten years. I have tested other units on the market and found Excalibur to be superior in service, performance, durability, price and quality. Excalibur is a product made perfect for the raw food community and others who are searching for high quality in their foods." Cherie Soria is the founder and director of the Living Light Culinary Arts Institute where she instructs and certifies raw food chefs throughout the world. Author of Angel Foods: Healthy Recipes for Heavenly Bodies. "As far as I am concerned, there is only one dehydrator -- the Excalibur. We use it exclusively at all our Living Light Culinary Arts Institute trainings and Healthy Lifestyle Celebrations. I trust the integrity of my Excalibur dehydrators and know I will get the results I need! Thank you Excalibur for creating such a quality product!" Gabriel Cousins M.D. is the founder and director of the Tree of Life Rejuvenation Centre in Arizona. He is one the leading educators in the raw food community, and author of several books including Conscious Eating. "We only use Excalibur Dehydrators at our Cafe at The Tree Of Life Rejuvenation Center for all of our Gourmet RAW Food preparations and everyone loves the quality and reliability, we highly recommend it as your first choice in food dehydrators"
Victoria Boutenko is one of the communities most inspiring educators and travels the country sharing her and her family's life changing experiences with raw foods. She is the author of several books including Raw Family, and 12 Steps to Raw Food. "Me and my family have been eating Raw food now for 10 years. We have 5 Excalibur's of our own and use them every day. They are excellent dehydrators and the best for raw foods. I use them for all my recipes, and recommend them to all of my students. I have known Excalibur's family staff for a long time and they always give outstanding service." Shipped from Toronto, Canada and not the USA. Beware of other retailers that have hidden shipping charges and customs/brokerage fees not included in the price. Our prices includes Free shipping in Canada.